His mom wheeled the vacuum past him. “Yes, I did. But not now it’s raining out. I don’t want you to get wet. Why don’t you play with your toys? “Didn’t you see the beware of mud sign I put up?” he asked. “I don’t mind.” he replied and opened the back door. From the time he could walk, he played in mud puddles. Wherever there was a puddle his dad would point it out and encourage him to jump in it. Sometimes they would jump in puddles together. That was the best. If his dad were home, he’d let him out. Smiling from the memories, Tom’s resolve grew. He had to get outside, he had to get permission to go. Tom decided that he was going to have to bug his mom until he got his way. He was parent-smart and had just the plan. He was going to be quiet. Parents hate it when children are quiet, it’s a sign of mischief-making. Quietly, Tom went to his book case, and picked out a few stories. Creeping through the house, he crawled behind the couch and began to read. By the time he was on page three he was lost in visions of playing in mud, and of all the types of mud puddles there are. Not all mud puddles are alike, he thought. Some are shallow and some are deep. Thick with mud and thin with water. Mud puddles are hidden in the grass of a rain soaked yard, and in the rows of a freshly tilled garden. They are on the sidewalk at the end of the street and in the park. Puddles can be made with a garden hose or in case of an emergency, puddles can be made with a bottle of water. A good summer mud puddle after a rain storm will be long and wide, ready to be pounced upon. Mud puddles in the fall and spring can have slush and ice. And winter is when mud puddles sleep. Tom played in the mud puddles he created in his mind. Imagining every detail. His mom would give in anytime now. Outside was in his grasp. When she came into the living room he sat still and held his breath. He could feel the beat of his heart in his chest. She couldn’t find him. Not yet. “What are you doing? I don’t like you hiding.” she said in frustration. Tom could see her feet through the space under the couch. She stood as still as he sat. How long was she going to stay there? More importantly how long could he hold his breath? Prickles ran across his face. His stomach tightened urging him to breathe. His nose began to itch, and the back of his throat tickled. Still she stood there. It felt like an hour. He couldn’t hold his breath any longer and let out a gasp. Tom poked his head out from behind the couch and stared at her. “I need to go outside.” he said. Tom sat silently. He crossed his arms too and stared at her intensely. He employed the special power that children have over their parents, guilt. She really wanted to let him go out and play in the mud, “Outside.” he said. His mom’s arms dropped to her sides and she breathed deeply. “Okay go on.” she gave in. “Woo hoo!” Tom yelled as he darted out the back door. Seven strides across the yard and Tom jumped up sailing through the air, his bare feet forward. He slid as he landed and he twisted and he turned with arms out for balance. He came to a slow squishy stop. From the door she watched him and smiled. Even if he was going to track mud into the kitchen, the expression on his face was priceless. Tom couldn’t believe it, it was the muddiest mud there ever was. “See, good mud sticks to you.” he called to her. Looking down at the mud, Tom pivoted his feet back and forth squishing the mud between his toes. With a big smile he faced his Mom and plopped down with a splash. Reaching into the murky water of the puddle Tom grabbed and squeezed the mud between his fingers. If Eskimos have a hundred names for snow, he was going to have a hundred names for mud. 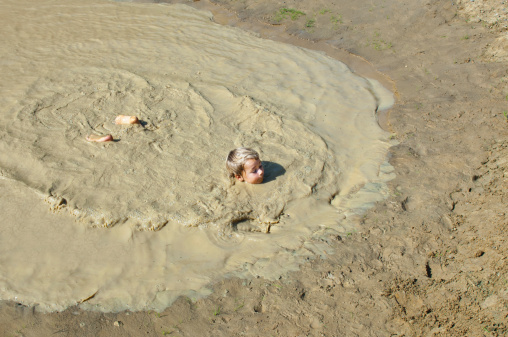 The world melted away around Tom, and he came to the conclusion that indeed, mud is the catalyst of his imagination. Mud takes hold of him and brings him great joy. Using his truck, Tom freed stuck dinosaurs as pterodactyls flew high over a mud volcano. On the deeper side of the mud puddle, a lone Viking forded a craggy fjord made of grass and pebbles. Standing up Tom realized that he was getting cold and he was hungry. At the kitchen door his Mom hosed the mud off him as best as she could. Looking back at his mud puddle, Tom smiled. Cookies recipe for the crust. Preheat oven to 350 degrees F (175 degrees C). In a large bowl, cream together the butter and sugar until light and fluffy. Beat in the eggs one at a time, then stir in the vanilla. Sift together the flour, cocoa, baking soda, and salt; stir into the creamed mixture. Mix in the chocolate chips. Drop dough by teaspoonfuls onto ungreased cookie sheets.Bake 8 to 9 minutes in the preheated oven. Cookies will be soft. Cool slightly on cookie sheet; remove from sheet onto wire rack to cool completely. Make the crust: Let the cookies become stale. I know this is hard when kids are around, and the cookies call to them like sirens to sailors, resist. Preheat the oven to 375 degrees F. Pulse the cookies in a food processor. Add the melted butter and process until moistened. Reserve 2 tablespoons of the cookie crumb mixture for topping, then press the rest into the bottom and up the sides of a 9-inch pie plate. Bake until set, about 10 minutes; let cool. Spread the 1/2 ice cream into crust; spoon 1/4 cup chocolate syrup mixture over layer. Spread the other half of chocolate ice cream over sauce. Cover; return to freezer until serving time. Top with whipped ream and drizzle with additional syrup just before serving. Makes 8 servings.